this weekend was stamp club saturday, and after months of not being able to go because of the house or other busy-ness, i managed to sneak by for a little while. i made just a few quick trading cards--an easy design, so i could make more there if i needed them. but it was a small group and i ended up having just enough! 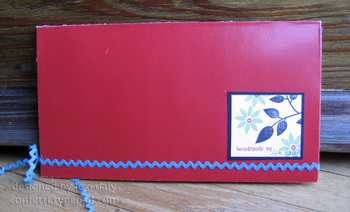 the theme was to make a letter card, with something stamped for the letter of your choice. the clear polka dot alpha from a muse is one of my favorite alphabets--both sizes!--so i started with that. 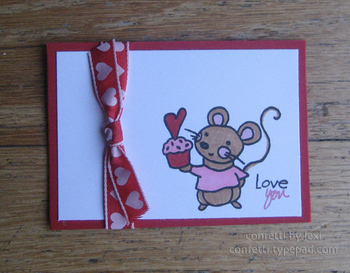 i think "b is for baby" is great for a quick baby gift card and baby mouse from the saltbox studio set, mama mouse and more, was the perfect baby to use. i masked the baby for a little added interest and changed the colors to show how easy it is to change the image from girl to boy. i do like quick and cute--and options, too! this looks a lot like friday's post, but it really is different, with a lot more below! yesterday was our new orleans stamp club meeting and i had to prep and pack in the midst of working on orders and cleaning the house for a showing--so busy! anyway, we were to make valentine trading cards, so like i often do, i took inspiration from the stuff still on my desk. and i really liked the saltbox studio stud muffin card from friday, so i made it x 10, with a few changes on the smaller version--a background layer instead of a patterned cardstock detail, copics instead of pencils, and spica for the "you" instead of a black writer. 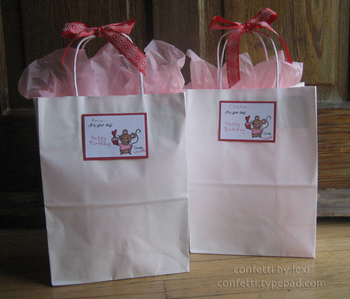 i even ended up with a couple extra that i hadn't added "you" and ribbon to, which came in handy today for quickly turning plain white gift bags into the perfect birthday wrappings, with room for colleen to add her own greeting. gotta love that! 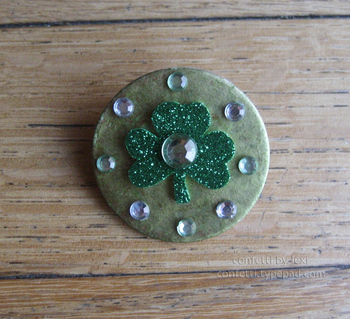 and a great little pin to wear on st. patrick's day! since i had to finish my trading cards there, i didn't get to all of the shoeboxes. but i brought home the supplies and directions, so hopefully i'll have those to show soon! after having to skip a couple of months because i was so busy with orders and family, i finally got to go to stamp club today! 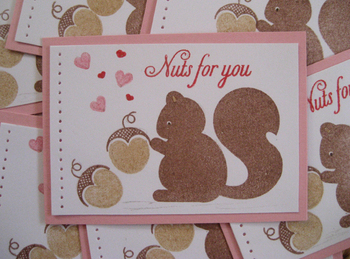 since we're coming up to another papertrey ink release, i decided to use my punny valentine for my trading card--i love this little squirrel! i often take papertrey ink and a muse clear stamps to stamp club because i can pack the cd cases easily and take lots of stamping options in very little space. it's always hard to plan a project and choose supplies to bring--i'm so used to working in my little studio and having everything within reach! yesterday was our monthly stamp club meeting at the local scrapbook store--and i finally got to go again after being out of town or going in too many directions the last few months! we swap atc's on a given theme and this month's theme was food. 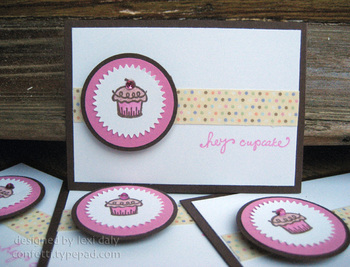 dessert is my favorite food group, so i went with this cupcake card. i love how the tiny a muse cupcake fits so well in the martha stewart starburst punch and the twinkle stickers make the perfect cherry on top! the making memories adhesive ribbon was a great (and quick!) way to add a little color and reminded me of sprinkles or confetti. 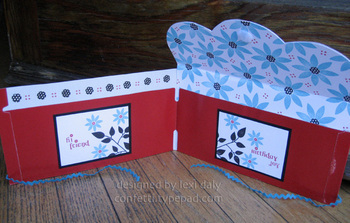 we also do a project and this month kim showed us how to make a card folio out of a folder. our directions had been to bring patterned paper that would match a primary color since the folders were primary colors. i packed in a rush and didn't have time to rummage through my papers--i figured i could always buy some there! 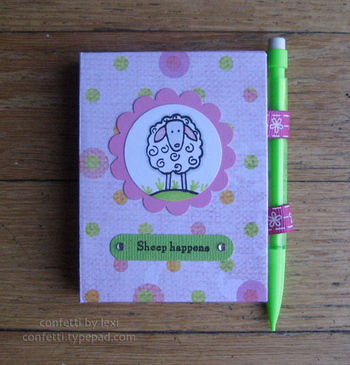 but i also brought the latest papertrey ink set beautiful blooms as a back-up. 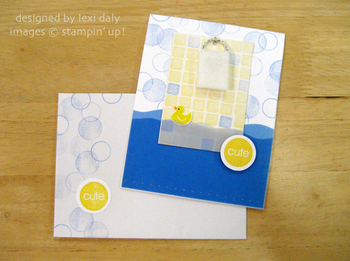 nichole's images are great for making your own patterned papers and coordinating elements. so after a half-hearted walk around the store, i ended up doing just that! 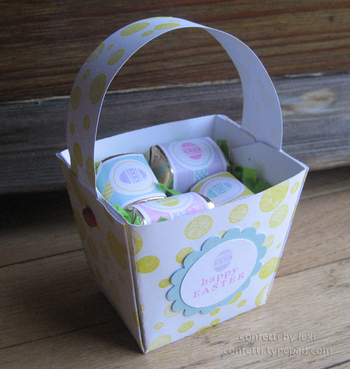 what a fun project--now i need to make a card set to put in the pockets and give it away. thanks kim! each month, one of our stamp club members brings a project for us all to complete, something new or something we haven't tried in a while. one of our members who has moved away sent us yesterday's project, a push-pull card, complete with a tutorial she found on chia's rubber stamp art. as i mentioned yesterday, i've seen them online, but never made one. thanks nicole! after getting the hang of it with the model she provided, here is one i created with the supplies i brought to the meeting. i always find packing for these stamp days a little difficult--what to bring, how to pack just enough and not too much, etc. my papertrey ink and other acrylic sets in cd cases were sitting on my desk, and it occurred to me--lots of images, little space! 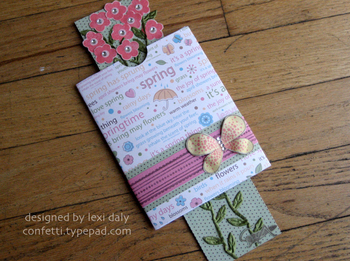 i also packed a spring card stack pad i found on sale at joanne's maybe a year ago (by dcwv, i think). it has various pattern and solid papers and card stocks and i thought it coordinated nicely with the papertrey ink images. so i tossed everything in--all set and more lightly packed than usual! 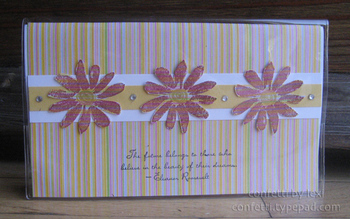 for the card, i used the spring word paper to cover the card, belting it with the green dotted strip and a strip of pink stamped with a faux ribbon pattern in brown. 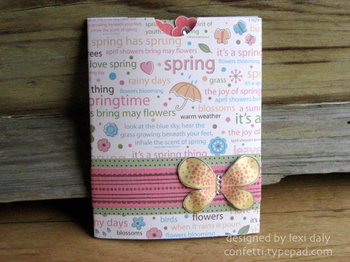 on the "ribbon" strip, i placed the dotted butterfly from butterfly kisses, choosing colors similar to the butterfly on the spring paper. when the card is pulled you see several cut out flowers from green thumb above, as well as a happy grasshopper down below. i was looking for ric rac on the ribbon spools at the store when i spied the leaf ribbon, which added such a fun touch. and so cool to pull the flowers & see them grow! what a fun project--thanks again, nicole! there's a stamp club here in new orleans that meets once a month at the local scrapbook store. having two kids with busy social lives, i don't always get to go, but i love it when all of our schedules are aligned just right--like today! the group always trades trading cards on a given theme. this month was spring and since i figured most people would think flowers and butterflies, i went with april showers for mine just to be different. 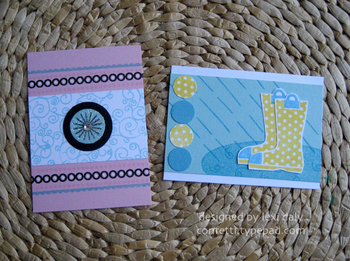 it's similar to my my pink and blue boot card--love that green thumb boot! and since i don't go every month, i always bring an extra just in case people have leftovers they want to swap. 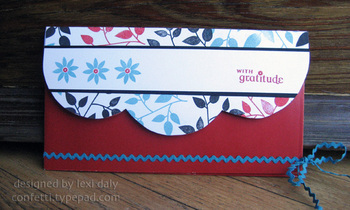 i took this opportunity to use my new faux ribbon set, also by papertrey ink! it's really fun to make different patterns--so many possibilities. the blue patterned strip is made from the swirl butterfly in butterfly kisses, like i did on this card and the little blue circle is covered with xyron and glitter with a jewel in the middle--so sparkly!